Is this a reaction to the Robinson programme? The latest daily poll from the YouGov panel has the Lib Dems down to one of their lowest shares in a long time – just 12 points. I wonder whether this is in part a reaction to the big political story on Friday, when the fieldwork was taking place, of the Nick Robinson BBC TV programme about how the coalition came about. It should be said that that YouGov has proved to be (see table below) the most volatile pollster when it comes to the third party. In the three years before the election it had shares ranging from 11% – 34% and it was the only one of the mainstream firms to have it ahead of both the Tories and Labour. Clegg and his team will, no doubt, point to the vast gap between the YouGov numbers and those from ICM only a few days ago when the party share was put at 19%. I’m hoping that we’ll see a survey in the next day or so from one of the phone pollsters that finished in the top half of the 2010 polling table. Will that back YouGov up? If it does and that follows through to the conference season then it will make life even more uncomfortable for the yellows. Why are the Guardian and the Telegraph the biggest losers? Is the coalition impacting on newspaper readership? Above are the June newspaper circulations figures and again we see the continued erosion in sales at the so called “quality end” of the market. This seems to be the same story every month though June, the first full month after the election and the formation of the coalition, seems to have produced bigger than usual year on falls particularly for the Guardian and the Telegraph. A random thought is that at the election these two papers backed one of the parties in the coalition yet the outcome for each is not what they wanted. The Guardian endorsed the Lib Dems only to find a few days later that their chosen party was doing a deal with the blues. The Telegraph gave their traditional support to the blues and now find a government where other influencers are in play. Is the Guardian, I wonder, now finding it harder to hang on to its Lib Dem readership while the Telegraph is having a similar problem with Cameron loyalists. Maybe I’m reading too much into it – but the big picture does not look good for almost the entire quality press. Is a foreign policy revolution taking place? Do Dave’s trips indicate a big change of emphasis? Julyâ€™s been a busy month for David Cameron on the foreign affairs front with visits to the United States, Turkey and most recently, India. In all three, heâ€™s been effusive towards his hosts and strongly positive about relations between Britain and the countries heâ€™s been in. Thatâ€™s all par for the course in diplomacy. Whatâ€™s much less so is the strength of his criticism directed elsewhere: implicitly towards France and Germany for blocking Turkeyâ€™s application to join the EU, and overtly towards Israel over Gaza and Pakistan over terrorism. There are of course various different games all going on at once here. The point about Turkeyâ€™s membership is in part the kind of tactical positioning that often goes on in the EU, ensuring that someone else takes the blame for blocking reform or development. Itâ€™s also about frustrating federalist ambitions. Taken together though, thereâ€™s a strong indication that the government is looking to significantly refocus Britainâ€™s foreign policy priorities, away from the legacy of the second half of the 20th century and towards the expected developments of the 21st. Despite his â€˜junior partnerâ€™ comments, itâ€™s notable that various members of the government have been quite firm on seeing 2015 as a deadline for withdrawal from Afghanistan (which is, it has to be said, well over a decade after the 9/11 attacks), a timeline which looks independent of American priorities. Itâ€™s difficult to imagine Tony Blair making that kind of remark or being so outspoken about Israelâ€™s actions in Gaza (something that will also have been noticed across the Atlantic). The criticism of elements of the Pakistani authorities for their ambiguous attitude towards terrorist elements in their country ties in with the Afghanistan situation but also contrasts both with his statements in Turkey – a very different kind of Islamic country – and the regional superpower, India. Itâ€™s not difficult to see what the increasingly important relationships of tomorrow are seen as being. Those relationships are with the rising powers where there should be some degree of affinity and shared interest. Turkey and India are, unusually for their regions, both democracies, both relatively secular, both growing economically, both have geopolitical instability and threats on their doorstep and both are big – if it joined, Turkey may have the biggest population in the EU within 20 years; India has comfortably more people than the EU and USA put together. All this isnâ€™t to say that the old priorities will no longer be seen as important. For one thing, thereâ€™s the geographic fact that the UK is a European and Atlantic country. For another, the EU, NATO and historic ties arenâ€™t going to simply disappear. Even so, the visits and the (un)diplomatic language suggest at least a loosening of those old alliances in favour of a more multi-tiered approach. Not before time, some will say. Perhaps so, but difficult and potentially dangerous manoeuvring which will call for careful handling at high levels, especially when there are already more than enough obstacles to trip up the government on the home front. The above shows the YouGov projections and the actual first round shares in the final YouGov poll before the 2007 Labour deputy race. As can be seen the big variance was in the union section with the John Cruddas numbers. This was felt at the the time to be down to the timing on the fieldwork – taking before the only TV debate and before the main union had sent out supporting material in their publications for Cruddas. He was the only one who was not a minister and had a lower public profile. In the members section YouGov did pretty well with the big exception of the large overstatement of the Hillary Benn figures. A big difference between 2007 and now is that was a contest for deputy – this is for leader. Turnout is likely to be much higher particularly within the union sections which could have a big influence. Punters pile on Mili-D after YouGov? But could the race still produce a surprise? It was inevitable that the first opinion surveys restricted to those who can actually vote in Labour’s election was going to spark off a fair amount of activity on the betting markets. The big move has been to the elder Miliband where the best bookie price is now 1/2. His brother Ed has moved out to 7/4 while Balls/Burnham/Abbott are now seen an rank outsiders with almost no chance whatsoever. On Betfair the picture is even worse for the non-Miliband three. We now move into the holiday month of August with the ballot papers going out on September 1st. The one element that could muck up the YouGov picture of a DaveM victory is the trade union section because the ballots will be accompanied by recommendations from each of the affiliated unions on which way members should vote. With Ed having the backing of the big three then that could possibly close the gap. Th other thing YouGov did was to blunt the scale of benefit Mili-E would get from 2/3/4th preferences. How these will break is probably going to be less significant than some EM backers were hoping. Will the coalition go half way or not? Is last night going to aid or hinder its survival? 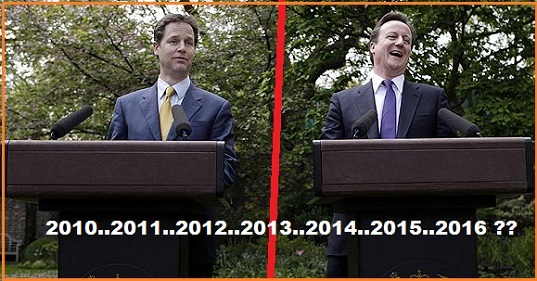 It’s the big question in British politics – how long will the coalition last? No doubt we’ll all have our own views which might have evolved following the revelations that came out in last night’s programme on what happened in those five days after the election. I am talking with one of the big spread betting firms about them establishing a “number of coalition weeks” market and have been asking around for views. Currently the consensus is that the opening point for betting should be about 130 weeks or into the period immediately after the conference season in the year after next. That would be end October/early November 2012. 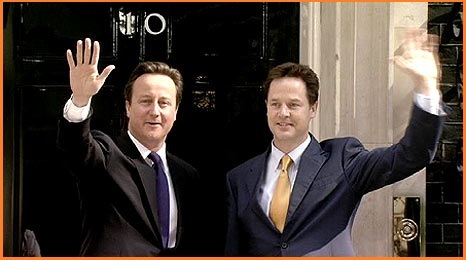 A break can, realistically, come from two parts – disgruntled elements within the Libs Dems who would challenge the deal and Clegg’s leadership – or right-wing elements within the Tory party who, presumably, would oust Cameron at the same time. My reading of the yellow position is that it will now take an enormous amount to prompt a splinter – even if the AV referendum does not produce a YES. They’ve gone down this route and the only real option is to stick with it for better or for worse. What last night’s programme did not show is the extraordinary lengths that Clegg went to in order to ensure that there was a consensus and this will hold him in good stead however difficult it gets. It’s the blues, I believe, where the pressure will come from and the circumstances in which the party agreed to the AV referendum commitment will continue to cause trouble. For apart from Labour the big losers in the whole arrangement have been the Tory right. 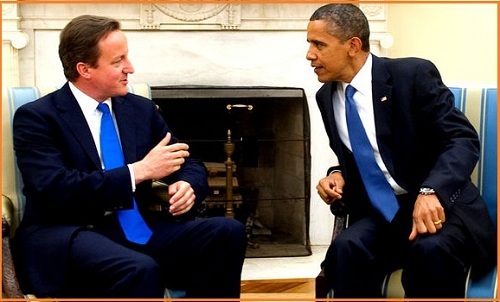 They’ve been marginalised and at some stage there might be an attempt to break Cameron and the deal. One other thought from the programme was the role taken by Andrew Adonis. He’s a defector from the Lib Dems and seemed to be the big backer of the red view that the yellows should jolly well do as they are told. Maybe that reflects his own political journey? What he did not grasp was that after being made a generous offer by the Tories then the LD team had high expectations from Labour. Mandy seemed much more realistic. One thing’s for sure -this story will run. The first YouGov poll members of those able to vote in the Labour leadership election, is just out and suggests that David Miliband is heading for victory. The older brother is leading in all three sections of the electoral college on the first round and the firm projects that in the final round of counting Dave will beat Ed by a 54-46 margin. This is big news and should reinforce the betting. Further reflections I think that this is a brilliant poll for DM and the scale of the challenge facing EM with lower preferences is enormous. DM is on 37% after the first round and an overall 35% put a non-Miliband in first place. So DM just needs 13/35ths of the balance in lower preferences while his brother needs 22/35ths. But we know that in this form of election a significant chunk of voters ONLY name their number one choice – thus requiring an even great proportion of the Abbott/Burnham/Balls votes to give their lower preferences to EM if he is to win. Was this the creation of Gordon Brown? Was it his inaction that made the coalition possible? Lots of things are popping up ahead of tonight’s big programme on the BBC telling the story of how the coalition came about. The presenter, Nick Robinson, has a long piece in the Telegraph giving us a flavour of what to expect. “..The Tory leadership was well prepared for a hung parliament. They had analysed the overlaps and the gaps between the Conservative and Lib Dem manifestos so that a day after the election they could table a series of documents focusing on 11 areas of policy, highlighting where agreement would prove hardest to achieve, and possible compromises. Although all claim that their minds were on the likelihood of a minority government, William Hague and George Osborne confirm that David Cameron spoke to them before polling day about a possible coalition. In stark contrast, Gordon Brown had not prepared a policy offer, nor got the backing of his Cabinet, nor developed a relationship with Nick Clegg. This despite the fact that he must have known that a Lib/Lab deal was likely to be his best hope of political survival. When I put it to Peter Mandelson that Clegg found Brown impossible, the Prince of Darkness replied with a wry grin that “Noâ€¦ he’d found him Gordon-ish”. In the end it does come down to those personal releationships and maybe if Brown had planned then we would have a very different government today.